What Is Mantua's Relationship to TYCO? In addition to reviewing the information provided on this page about MANTUA, one should also read the History page on this site to better understand TYCO and MANTUA. The information regarding Mantua's history provided here is largely taken from the company's 2001 75th Anniversary final catalog. Across the bottom of the pages of the 2001 Mantua catalog a timeline is presented that provides information on important points of interest in the company history. In 1926, The Mantua Toy and Metal Products Company is founded by John N. Tyler, James P. Thomas, and Pauline B. Tyler. Mantua's first project was to produce Triple-T Electrical Toys of Distinction. The Woodbury Heights, New Jersey Mantua factory began making items for the first time in 1933. 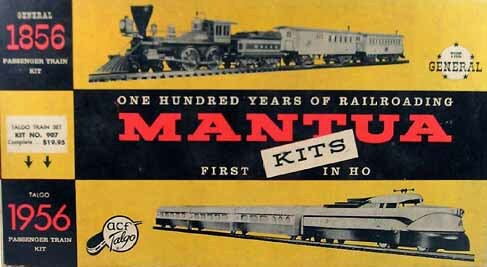 In 1935, Mantua introduced O-scale products. Mantua offers "Ready-Laid Track" and ready-to-run train sets in 1937. At the close of World War II, Manuta received the Army-Navy "E" Award for the company's excellence in the production of wartime equipment. Manuta made mapping and measuring instruments for the Allied troops. The name TYCO appears for the first time in 1952. TYCO's first offerings in the early 1950s were a line of ready-to-run train sets. The name TYCO comes from Tyler Manufacturing Company. HO-scale slot car sets first appear under the TYCO name in 1963. The split between Mantua and TYCO has its beginnings in 1967. Norman Tyler, son of founder John Tyler, becomes president of Mantua in '67. Norman Tyler oversees the incorporation of the company under the new name TYCO Industries. Consolidated Foods/Sara Lee purchases TYCO Industries in 1970 with Norman Tyler remaining as company president. The Mantua name makes a comeback beginning in the late '70s. The Tyler family buys back the original Mantua line of products from Consolidated Foods in 1977. This group of HO-scale trains consists largely of the items found during TYCO's Red Box Era and before. Nearly all steam engines and a few of the diesel locomotives, plus an assortment of rolling stock are included in the new Mantua product line. The initial diesels included the F-unit, correctly labeled and F-7, the GP-20 and a Plymouth Yard Diesel. The late '70s Mantua diesels differ from their TYCO counterparts in that the Mantua locos featured the company's power truck motor and not TYCO's PowerTorque motor. Mantua continued to offer an expanding line of model trains in the 1980s and '90s. Eric Tyler, grandson of Norman Tyler, became vice-president of Mantua and oversaw the introduction of a line of ready-to-run train sets in 1990. Mantua added an N-scale Superbowl Express train set in 1993. The Mantua Collectibles line of steam engines began appearing in the mid 1990s. During this period the F-7 and GP-20 diesels saw a number of improvements. A brass flywheel motor and full 8-wheel drive with a die-cast metal chassis greatly improved the performance of the Mantua diesels during the 1990s. Also during the '80s and '90s, Mantua picks up many former pieces of rolling stock that were once part of the Lindbergh line of HO-scale trains. The 43' Gondola and 36' center cupola New England-style Caboose are both examples of cars added to the Mantua line from the former Lindbergh offerings. Following the 2001 line of Mantua train offerings, Model Power has purchased what appears to be the bulk of the Mantua product line. Model Power has made some changes to the line and brought items back under a new 'Mantua Classics' name. This new selection of Mantua items has included steam engines, rolling stock, and the GP20 diesel locomotive.